Hide came to us highly recommended, and he did not disappoint us. He was very friendly and knowledgeable. We had a great time! We thouroughly enjoyed our two days in Tokyo with Hide. He was extremely knowledgeable on Japanese history and culture and spoke excellent English. We chose to do two days with the first day spent visiting neighbourhoods in eastern Tokyo and the second day in western Tokyo. We left with an good understanding of the City. We would highly recommend Hidefumi. This was an excellent tour full of information.! Our guide was extremely interesting,clearly understood what would interest us.A most enjoyable tour and a great way to understand Tokyo better. We have no hesitation in giving Hide a 5 star recommendation . He was extremely knowledgeable and gave us a very interesting tour during our first day in Tokyo,very helpful in helping us get around the city on the metro. He speaks English very well and gave us some useful tips on other places to visit in Japan. He is very friendly and courteous and we enjoyed his company,thank you Hide! Hide's tour was exceptional! He was not only knowledgeable but he had a great sense of humor. He knows Tokyo like the back of his hand. My sister and I thoroughly enjoyed our tour and lunch with Hide. I would highly recommend him! Hide did an outstanding job; he was on time, well organized, spoke excellent English and focused on our needs. Unfortunately, I encountered knee and leg problems that made extended walking difficult, and this caused me to reduce some of the planned activities. But this in no way reflects poorly on the services Hide provided. I would recommend his services to others and see him as a valuable resource in the tourism community. Hide gave us a very good day tour of Tokyo highlights. He was prompt, friendly, and knowledgeable. Much of the time had to be spent in the subway system, but that was necessary to get from place to place efficiently. He met all our expectations, and we would certainly recommend his tours to anyone visiting Tokyo. Hide showed up at our Airbnb right on time and took us on a 6hr tour of Tokyo. My friend and I was very impressed with Hide's English and all of his knowledge of Tokyo. Get your walking shoes on, a bottle of water, and you are set. I highly recommend Hide's service. We enjoyed Hide as our tour guide. Our day with him was fun and well planned. He took us to all the highlights of Tokyo. We learned many interesting facts about Japan history and culture from Hide. His English is excellent since he did his university study in the US. We would definitely recommend Hide to our friends and family!!! Thanks for making our first trip to Japan memorable. Hide was a terrific guide and took us around on a walking tour and we covered a lot of ground! He helped us to get our subway/train pass that we used while we ere with him and then again on our own. We really enjoyed the variety of places he took us, from the must see tourist locations as well as real tokyo neighborhoods where we watch children walk home from school. It was a real treat to spend the day with Hide and I highly recommend. Hide was excellent and very knowledgeable. Excellent guide with a good command of English. He showed us many areas of Tokyo we would not have seen otherwise. Knowledgeable, friendly, informative. We highly recommend his services and enjoyed him as our guide for two days in Tokyo. Hide is a most considerate and informative guide. We are not highly mobile but he showed us wonderful sights in Shinzuku and Ueno, found lovely parks, temples, cafés and shops and even had time to teach us a little Japanese history, which we loved. Hide's English is excellent. Thank you Hide for a wonderful day. I would like to thank my tour guide, Hidefumi for his excellent private tour of Tokyo on Saturday, June 2. He gave us the opportunity to customize our tour so that my husband and 22 year old son and I could experience the local flavor of the city, as well as to visit the important tourist's highlights. Hide is very knowledgable and we all enjoyed the personal touch he brought to our first day in Tokyo! Thank you, Hide for the excellent tour! Hide was truly awesome. We greatly appreciated him waiting for us as our plane was late and he started the tour late and gave freely of his time. He was very informative, knowlegable and passionate and happily matched his pace to our quite slow one and gave us frequent breaks as needed. He answered all our questions and gave us several tips for our tour of Japan. He is a lovely man and a wonderful guide and we would recommend him to everyone. Hide was very informative and extremely personable. Hide is a friendly and personable guide who showed us traditional (Tsukiji market and Yanaga) and non-traditional (the anime and manga world of Akihabara) sights at our pace. We also got to enjoy sushi in Tsukiji and unique Japanese snacks and sweets in Yanaga! Exploring this large and diverse city using the subways made it exciting and more fun than by bus. Thanks Hide for sharing your hometown with us during this 6-hr walking tour! I met Hide at the airport. He was where he said he would be for our meet and on time . I shared with him my interests and this is exactly what he gave me. He is knowledge and friendly . A great host! "Only bring your smile as a souvenir from Switzerland". This is what Hide asked for when we offered him to bring a little something from home. Well, we brought our smile and it got bigger and bigger during the Tokyo tours (1,5 days). Our family of five was very well threated with a perfect seletion of highlights for all of us, good choice of restaurants, many background information and insider tipps. Thank you Hide! Excellent, knowledgeable guide and very pleasant personality. We met Hidefumi on prior days but this was the best. We got to know a different side of Tokyo. Hidefumi showed us not only the city, but how people live, respect and love their city and country. Great experience and great person. Hide was great. His English is excellent and he was very professional and knowledgeable. He helped us gain insight into common Japanese culture explaining concepts like Salary Man. He also explained how Shintoism and Buddhism are practiced in modern Japan as well as the differences between shrines and temples. Made later visits to attractions more interesting. Made the tour enjoyable even through bouts of rain. Recommend Hide highly for an informative, efficient tour. What a wonderful day with a wonderful guide! Hide-san is very knowledgeable, planning our tour to suit our specific interests which are to experience more of Japan's traditional culture than today's pop culture. This is our first time in Japan so we were able to familiarize ourselves with Tokyo's Metro system with his guidance and feel quite confident now to venture out on our own. The fact that Hide-san enjoys sharing his city is quite evident and enriched our experience. Thank you very much Hide-san. Hide was a pleasure to spend the day with. He was knowledgable and considerate. I highly recommend him. Spending half a day with Hide-san was a great pleasure and an excellent introduction to Tokyo. In my view there is no substitute for seeing a city from the perspective of someone who lives there and Hide's tour gives you that opportunity. 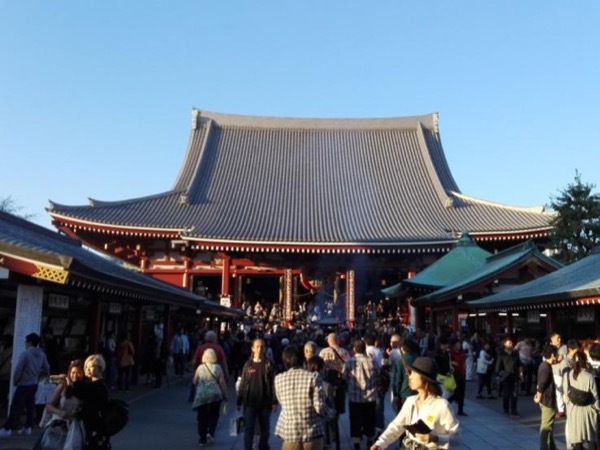 That's not just a question of the contrast between the Edo-era shrines and market of Asakusa and the full-on neon of the pop-culture scene in Akihabara, but rather, someone like Hide to point out the cultural and historical continuity between the two. Friendly, flexible and Hide has very good English language skills. Our tour was very informative and most enjoyable.